At the suggestion of Shino Aburame, their homeroom teacher, Boruto and his classmates split off into gendered teams to capture flags placed on the roof. 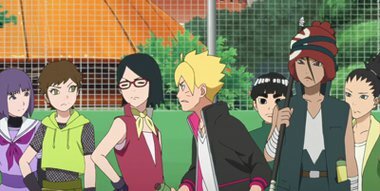 Boruto and the rest of the boys' team quickly head for the roof, but they struggle with traps and the girls' team, led by Sarada Uchiha and Chocho Akimichi. Desperate to capture a flag before the girls' team, Boruto tries out a Summoning Jutsu, but he ends up summoning something unexpected!